For the campaign level, see The Ark (level). Miranda Keyes: "Where would someone go to activate the other rings?" Installation 00, also known as the Ark and sometimes translated as Waypoint, is a Forerunner installation from which the entirety of the Halo Array can be activated. Installation 00 also functions as a potential safe haven from the Halo Array's strategic pulse, and as a facility to construct replacement Halos if necessary. The Ark is situated outside the galaxy, about 218 (262,144) light years from the galactic center. Although later universally known as "the Ark", Installation 00 was originally one of two installations identified as Arks, the other being the older greater Ark. Due to this, Installation 00 was also referred to as the lesser Ark to differentiate it from the much larger greater Ark, whose foundry produced the original array of rings 30,000 kilometers in diameter, as opposed to the 10,000 kilometer-wide foundry of Installation 00. Installation 00 sending the Halo Array through a slipspace portal during the Forerunner-Flood war. The Ark was designed with a number of functions, one of which is to remotely activate the Halo rings from outside the array's blast radius. Installation 00 can be placed on standby mode via a fail-safe system that is activated by an aborted firing such as the one that occurred at the end of the Battle of Installation 05. In addition to serving as the firing control center for the Halo array, Installation 00 functioned as an automated factory to construct Halo installations, thereby ensuring that the Halo Array was always ready to fire. While originally designed solely as a construction and control center for the Halos, due to the Librarian's influence, the Ark was given a secondary function as a safe haven for life in the galaxy in the case of a galaxy-wide activation of the Halos; this is also the source of the name "the Ark". Knowing that the Array would defeat the Flood through sterilizing the galaxy of any neurologically complex life, the Forerunners planned to preserve all life by storing it on the Arks and other preservation facilities. According to this plan, known as the Conservation Measure, the Librarian was to index every sentient species in the ecumene and bring specimens of each to the Ark. These sentient species would be stored on the Ark and would later be reseeded on their original homeworlds after the Halo Array had been activated. The IsoDidact activates the Halo Array from Installation 00's citadel. "Every vessel we can fill, we send to the Ark. I dare not cease the mission. Not now, not until I've done all I can. Each one of these souls is finite and precious. And I'm close. Close to saving them all." Like the rest of the newer, more efficient Halo Array, Installation 00 was constructed sometime between 98,445 BCE and 97,445 BCE under orders of Master Builder Faber, to address problems with the greater Ark and its larger Halos. While plans for the second Ark had existed for some time, its construction was delayed by the Old Council to avoid the Builders from gaining too much power. The lesser Ark, as it was known at the time, was designed to produce smaller but much more powerful Halo rings, which could be transported more efficiently and could deal far more widespread damage. Until the very last days of the Forerunner-Flood war, the lesser Ark, its new Halos, and its location were kept a well-guarded secret; only the most top-tier Forerunners knew of its existence, and the only one who knew the exact coordinates of the installation was Faber. Whereas the greater Ark acted as the Forerunners' final line of defense and command center, the lesser Ark would serve the function of a last fallback point where its own array of rings could be swiftly distributed to their designated locations across the galaxy and fired to cleanse the galaxy of all sentient life as a last resort. In the endgame of the Forerunners' war with the Flood, the Forerunner Contender-class artificial intelligence Mendicant Bias, which had been corrupted by the Gravemind and defected to the Flood, attacked and destroyed the greater Ark, killing the majority of the remaining Forerunners who had taken refuge there. Using coordinates provided by the Master Builder, a handful of survivors, including the IsoDidact, managed to escape to the lesser Ark where they prepared their weapons of last resort. In order to buy the IsoDidact time, the Librarian traveled to Earth, broadcasting a feint transmission intended to draw the Flood's attention to her. She spent her last days in the plains near Mount Kilimanjaro, near the site of the slipspace portal to Installation 00. Mendicant Bias knew of the secret Ark and how to access it through the Keyships, though he did not know of its exact location. In order to devise the best possible defense against Mendicant Bias, the Forerunners deployed Offensive Bias, a military AI formerly in control of the greater Ark and Mendicant's replacement, and sent it to counter Mendicant Bias' fleet in advance before it could reach the Ark. While Offensive Bias engaged Mendicant's fleet, the IsoDidact completed preparations for the Halo Array and fired the rings from the Ark, purging the galaxy of all life. Following the Array's firing, Offensive Bias defeated Mendicant Bias within minutes. Offensive decided to spare the last portion of its opponent and delivered it to Installation 00 for study. There, the remaining Forerunners, led by the IsoDidact, held a trial for the AI for betraying the ecumene. The Didact decided to keep Mendicant alive as it had intimate knowledge of the Flood and could be called upon in case of their return. Bias was entombed in the installation with only one thought allowed to him: atonement. The Fleet of Retribution and Truth's fleet meet above the Ark. Immediately following the Prophet of Regret's botched invasion of Earth on October 20, 2552, the Prophet of Truth dispatched a Jiralhanae-led fleet to continue the assault and to uncover what he believed to be the Ark. By November 17, the Covenant had uncovered the structure they had spent the last month unearthing. Truth, through his Forerunner Dreadnought, activated the device, which was actually just a portal generating structure which led to Installation 00. Truth led his fleet through the portal; after defeating a Flood invasion of the town of Voi, a joint United Nations Space Command - Sangheili strike force followed the Prophet's forces. Upon their arrival on December 11, the latter force were attacked by the Covenant, which held a 3:1 numerical advantage. Despite this, the Sangheili Fleet of Retribution crushed Truth's forces. After engaging the Covenant across the installation, Spartan John-117 and Arbiter Thel 'Vadam entered the citadel, where they found Truth, who had been infected by the Flood. 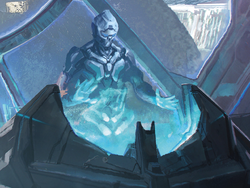 Soon after 'Vadam killed the Prophet, effectively destroying the Covenant and ending the war, he, the Spartan, and 343 Guilty Spark, the former monitor of Installation 04, discovered that a replacement Installation 04 was being constructed by the Ark's foundry. The Spartan and the Arbiter soon rescued the AI Cortana, who held Installation 04's activation index, from the Flood-infested Covenant capital city, High Charity. They, with Sergeant Major Avery Johnson, assaulted the Halo's control room to activate the ring, destroying both the Flood and the remaining Covenant forces. They succeeded, though Johnson was killed by the monitor. While Guilty Spark refused to allow his new Halo to be destroyed, he also implied that he was protecting the Ark. The partially constructed installation's activation tore the ring apart and severely damaged the Ark. In March 2553, the Office of Naval Intelligence deployed an automated probe-carrying spacecraft to the damaged Ark using advanced slipspace technology. The ship arrived in November and dispersed its probes, although all communications with the devices were cut off after initial transmissions confirming the Ark's survival. In response, the UNSC Rubicon was sent from Luna in December 2553 to conduct a more thorough investigation of the installation's ravaged surface. Due to the damage dealt to the Ark's life support systems and its artificial sun, heavily inclement weather became the norm. The Rubicon carried several remote contact teams, who landed on the damaged Ark and attempted to find the source of the mysterious signal. After about eight days, contact with all teams was lost; only one team, RCT-06, returned, having sustained heavy casualties and carrying with them a device of unknown nature. The armature's origin was subjected to debate, but it was believed by the team to be the source of the beacon picked up by the initial investigative group. The device, actually a broken, barely active monitor, began to relate its past life as a human: Chakas. Though the ship's ONI attaché initially doubted the veracity of the monitor's account, the science team leader pointed out that it was consistent with the "Bornstellar Relation" found on Onyx. Eventually, the monitor revealed that it was none other than 343 Guilty Spark himself. Claiming that he knew the location of the Librarian, whom he believed to be alive, Spark subsumed the ship's AI, knocked out the crew via the life support systems, and hijacked the ship. Communications with the Rubicon halted within 48 hours of its last report. Search and rescue teams were then deployed to the site, but reported no findings. The last of its ground team, Bobby Kodiak, was left stranded when the Rubicon left, and mortally wounded by attacking chaefka. It was then that he was contacted by the Ark's monitor, 000 Tragic Solitude, who had survived the Ark's devastation and sought to repair the station and get revenge. Offering him a chance to live, Tragic Solitude rescued Kodiak and mended his body with cybernetics, turning him into a cyborg and putting him under the monitor's control. For the following two years, Solitude then repaired the Ark and prepared for an attack on the galaxy. N'tho 'Sraom and Frank Kodiak engage morolaath during Operation: FAR STORM. In 2555, the Ark was partially restored and Tragic Solitude enacted its plan. Using Kodiak to activate the process, Tragic Solitude initiated a countdown to the rings' firing in several weeks. This was so that someone within the Milky Way galaxy would open a portal to the Ark in an attempt to stop the countdown, allowing the monitor to dispatch its Retriever Sentinels to kill all sentient species and mine their planets to repair the Ark. The countdown was discovered on the intact Halo rings soon after and a human-Sangheili joint task force departed to the Ark through the Portal at Voi. The expedition's ship was intercepted and brought down above the Ark by Tragic Solitude's Retrievers, but the crew survived and managed to reach the Array's control center and stop the countdown. However, the portal was still open and Tragic Solitude deployed a fleet of Retrievers to Earth in an attempt to mine the Sol system's worlds, causing heavy damage to the region surrounding the portal as well as the UNSC Home Fleet. However, the UNSC-Sangheili crew managed to thwart the monitor's plan and the Retrievers were recalled, with the monitor ending up destroyed. UNSC reinforcements were deployed through the portal to the Ark soon after and rescued the expeditionary crew. With Solitude destroyed and the Retrievers now dormant, the UNSC began to establish research facilities on the Ark and study the Sentinels in hopes that they could be commanded to continue repairing the installation by strip-mining lifeless systems so that no one would be harmed in the process. Captain James Cutter and Dr. Ellen Anders survey the Ark from high above it. "And now the Ark's defenses stir, sensing the shadow of a threat that moves in spaces Her eyes cannot see, intent on seizing the great factory of the Forerunners." Following the Created takeover of human space on October 28, 2558 the Ark's failsafe measures prevented Cortana and her allies from being able to access the installation. A month later, the Banished, led by the Jiralhanae warlord, Atriox, laid siege on the UNSC bases on Installation 00, among them the Henry Lamb Research Outpost. Shortly after the Banished's attack, the UNSC Spirit of Fire, drifting in space for 28 years, was abruptly transported to the Ark by a mysterious entity. Those on board the Spirit of Fire came into conflict with the forces of the Banished on the surface soon after. During the battle, it was discovered that the Ark had constructed a new replacement Halo, which was launched by Professor Ellen Anders in an effort to deploy it to the Soell system and raise a distress beacon to the UNSC. However, the Halo was intercepted on the way to Soell by a Created Guardian, while the forces of the Spirit of Fire and the Banished remained in conflict on Installation 00. During this time, the Flood, who had survived aboard the ruins of High Charity, were inadvertently released by Voridus and Pavium when they breached the containment shield around the structure with a Scarab and deactivated the Ark's Sentinel defense network in the process. The Flood began a second rampage on the Ark, forming a Proto-Gravemind that quickly began turning into a Gravemind. Voridus and Pavium managed to reactivate the Sentinel defense network and with the help of a Retriever Sentinel, killed the Proto-Gravemind before it could finish its transformation into a Gravemind. With the Proto-Gravemind dead, the Banished and the Ark's Sentinels were able to contain the Flood once again. Installation 00 resembles a massive flattened dish with a series of eight curved arms, known as spires, four large and four small, arranged around its rim, similar to the petals of a flower. The entire upper surface is terraformed, with oceans, forests and deserts. Installation 00 is 127,530 kilometres (79,243 mi) in diameter and thus one of the largest known Forerunner constructs. Spread throughout the installation are hundreds of refugia, artificial biomes designed to sustain diverse flora and fauna as part of the Conservation Measure. Each of these refugia are separated by massive quarantine walls. Twelve refugia are located on the central hub, while an additional twenty are located on the arms of the structure. The various refugia are intended to mimic common planetary environments - one such refugia known as the Halo Refugia bore a notable similarity to Earth's climate, though much more extreme; mountains are higher, chasms are deeper and the sea and sky are a deeper blue. At the center of the installation is the Foundry, an enormous circular facility used to construct Halos. The core of the 10,000-kilometer-wide Foundry is a hollow space, home to a stripped remnant of a material-rich celestial body used to obtain the vast amounts of resources required for the construction of a Halo ring. When active, the Foundry generates so much heat that the Ark requires multiple cooling stations. At least two such systems span a snowy gorge; it is possible that the massive cooling systems caused this icy climate. Like the shield worlds, Installation 00 possesses an artificial sun. Like the Halos, Installation 00 features multiple Cartographer facilities, map rooms that can pinpoint any location on the installation. Similarly to the Halos, the Ark features a control room from which the array could be activated. This facility, known as the citadel, is protected by a system of energy shield barriers that encircle the center of the disk. These barriers are controlled by towers that circumscribe the center of the installation. The Ark also possesses a vast network of power grids beneath its surface. These grids can be tapped into by structures on the surface known as Power Nodes when extra locational power is needed in emergencies. These nodes were co-opted by UNSC and Banished forces in 2559, though Banished Power Extractors were also able to tap into these power networks. Similar to most Forerunner installations, the Ark had its own monitor, 000 Tragic Solitude, charged with the facility's defenses. For the most part, Solitude reacted little when humanity and the Covenant arrived at the Ark, though when 343 Guilty Spark attempted to access the Ark's systems during the Battle of Installation 00, Tragic Solitude threatened to add the monitor to the facility's targeting ledger if he persisted. After the Ark was severely damaged by the destruction of Installation 08, the latest on a line of destroyed Forerunner relics, Solitude grew bitter and viewed all sentients in the galaxy as incapable of being peaceful. The arrival of the Human-Covenant War to the installation additionally prompted the activation of Terminus', structures that are designed to perform tireless cataloging, recording of indexing of events in an attempt to prepare countermeasures and defences for future possible scenarios. These records are cross-references with existing records of historical events and battles to perform simulations and predictions of potential outcomes - losing a terminus would result in a massive loss of operational capability for the installation. The Ark's small defenses were Aggressor Sentinels created by numerous Sentinel factories just like at the rings. The Retriever Sentinels could also be used offensively, though they were not usually outfitted with weapons until Solitude began arming them. The Ark was also guarded by armigers, humanoid defense droids that were capable of attacking with energy rifles and staves. Tragic Solitude could also take control of the Ark's wildlife and even people through manipulating their brain waves. The Ark also possesses a Sentinel defense network that coordinates Sentinels to assemble and attack anything deemed a threat to the Ark. Isabel utilized the network to destroy Enduring Conviction by firing the assault carrier's energy projector at the Ark, alerting the Sentinels in the area. During an operation led by Major Vaughan, a Controller Sentinel attacked anyone it deemed a threat, even the UNSC, due to constant abuse of the teleportation network before the UNSC Spirit of Fire's arrival. Voridus managed to shutdown the Sentinel defense network around High Charity's crash site, but at the price of the Flood being released from the ruined city. When the network was reactivated, the Sentinels resumed their duties and aided the Banished in defeating the Flood, enabling them to enact the containment protocol once again. At some point after the initial battle on the Ark, a containment shield had been created around High Charity's ruins as a measure to keep the Flood contained within and was successful until the shield was breached by Voridus. A surface view of Installation 00's arms. The installation's artificial star can be seen in the sky. The Ark has a habitable surface on each of its spokes and on the majority of the inner circle, apart from the foundry. This terrain was intended to support cataloged life forms prior to being reseeded throughout the galaxy. These landscapes and biomes are as diverse as those of Earth and of the Halos, including deserts, taiga, and deciduous forests. Several bodies of water occur across the installation. As such, the Ark can sustain its own ecosystem, providing a variety of habitation for many kinds of life. Like most Forerunner constructs, the Ark's atmosphere is similar to that of Earth, being mostly comprised of oxygen and nitrogen. This means that all known sentient species, with the exception of the Unggoy, can survive on the surface without any form of protection. As with the Halos, Installation 00 features a widely varying range of climates. As the Ark is located outside the galaxy, isolated in a black void of space, there are no nearby natural sources of light to power the installation and facilitate the survival of biological organisms on its surface. To counter this problem, the Ark is equipped with an artificial structure consisting of a bright, sun-like light, with several metal arms jutting from its center. The light source "scans" over certain areas to generate day/night cycles, further contributing to the growth of vegetation and controlling weather patterns. A standard day on the Ark is 35.3 hours long, though this can be adjusted. The activation of Installation 08 inflicted substantial damage to the Ark. While some life support units remain intermittently active, they were in severe disrepair. Combined with the artificial sun's weakened output, weather conditions on the surface have became highly volatile. Most indigenous fauna have perished, either from the Halo pulse itself or the extreme weather that came afterwards. However, some wildlife survived and was seen during Operation: FAR STORM. After the destruction of 000 Tragic Solitude, Luther Mann stated a belief that it was in fact the rogue Monitor who was behind the weather conditions as part of his plan for revenge. Once Tragic Solitude was destroyed, the weather returned to temperate conditions. A major aspect of Installation 00 was its ability to send and receive objects via slipspace portals. During the Fate of Maethrillian, the Forerunners attempted to evacuate the seven Halos which remained under their control to Installation 00, though only one escaped. Later in the Forerunner-Flood war, the rebuilt Halo array was dispersed throughout the galaxy through the use of these portals. In order to ensure the safety of humanity, the Librarian established a portal-generating structure near Mount Kilimanjaro on the human homeworld of Erde-Tyrene. During the Human-Covenant War on November 17, 2552, the Covenant forces under the command of the Prophet of Truth utilized this portal, sparking the Battle of Installation 00. The portal was used again in 2555 by Tragic Solitude, though he could not activate its doorway to Earth from the Ark's end. An unknown entity at the Ark generated a portal to transport the UNSC Spirit of Fire, which had drifted in interstellar space for 28 years, to the installation in 2559. After hijacking the UNSC Rubicon, 343 Guilty Spark used one of the Ark's remaining active portals to return the ship to the galaxy in an effort to find the Librarian. However, after its return to the Milky Way, the Rubicon crashed on Geranos-a. French L'Arche and Installation 00 in almost every media. La petite Arche in Halo: Silentium. Spanish El Arca and Instalación 00 in almost every media. The Ark was known as "Waypoint" during the production of Halo 3. This name was later rendered canonical by the Halo Waypoint forum administrator Catalog (posing as the Forerunner entity of the same name). In early conceptual stages, artist Paul Russel did not want to make the Ark significantly larger than a Halo ring. One of his early concepts of the Ark design incorporated a cradle for a Halo installation in the center, with four sleek arms one one side of the ring, along with several beams leading to a central hub structure situated on the other side. In Origins, the Ark and the Halos are depicted without land on their surfaces during the activation of the Halo Array. This is likely due to Cortana's interpretation, or an instance of artistic license, as both Halo: Silentium and the terminals in Halo: Combat Evolved Anniversary show that the Ark and the Halos had fully terraformed surfaces prior to the activation of the Array. The Ark as a concept has existed since the development of Halo: Combat Evolved. Bungie artist Marcus Lehto produced several sketches of structures for the Ark concept, that would later go on to be refined and considered during the development of Halo 2. These concept images both depict the Ark as a structure within the ground, a concept later instead used for the design of the Portal at Voi in Halo 3. The history and name of the Ark are a reference to the Biblical story of Noah, who was instructed by God to build an Ark to save specimens of every animal on Earth from a great flood. The name may also be a reference to Ark of the Covenant, which, according to the Jewish Torah and the Biblical Old Testament, contains the stone tablets of the ten commandments. It is the holiest object of the Jewish faith. The Ark has some similarity to the concept of an Alderson disk. However, an Alderson disk is much larger and has a star in the center. Early concept art depicting a planetoidal Ark. Early concept art of Waypoint, former name of the Ark. Concept art of Warthogs on their way to a Forerunner building after Installation 08's reveal in Halo 3. Concept art depicting the Ark and Installation 08 in Halo 3. The size of the Ark compared to that of Earth and a Halo installation. Comparison of the Ark to a modern Halo installation and Earth. The desert near the Ark's Cartographer facility. A holographic representation of the Ark. A small mountain clearing near the Citadel. A view of one of Installation 00's cooling systems. A view of most of Installation 00's surface. The Ark along with the Halo installations prior to their activation. The symbol representing Installation 00. Installation 08 over the Ark, a Halo 3 concept art reused for Halo Legends: Origins. Installation 00 in Halo Mythos. A hologram of the Ark in Halo Wars 2. ↑ The original Halo Array was created after the extreme faction of Builders won their political battle with the Prometheans and the Didact was forced into exile, in approximately 98,445 BCE. Installation 00 and its newer array of six rings was created some time after the first Ark, placing its time of construction sometime in the millennium before the firing of the Halos. ↑ Halo 3 level Narrows: "Without cooling systems such as these, excess heat from the Ark's forges would render the construct uninhabitable." ↑ Bungie.net: What IS this thing? !